Sammy Hagar plus his supergroup band, The Circle are hitting the road to showcase their endless and talented catalogue of music to their fan following! If you love their songs, from all of their individual projects then you will no doubt love this! They will be supported by Collective Soul and all will arrive at DTE Energy Music Theatre on Thursday 28th September 2017! Tickets are NOW on sale! 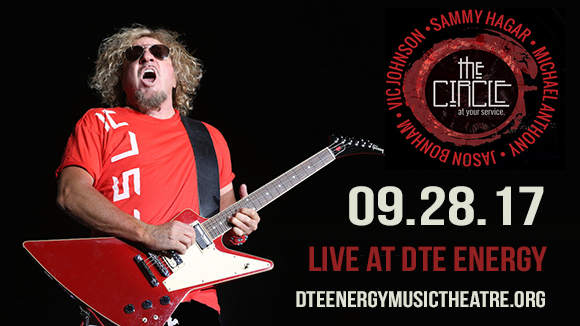 The legendary Sammy Hagar and his powerful band are hitting the road this coming Fall! Get ready to catch them LIVE.. their hard hitting sound is loved far and wide and has had a positive influence on music history. Since his breakthrough onto the scene, back in the 1970's, throughout to the 1980's with his hit song "I Can't Drive 55". The one and only, vocalist became the front man of Van Halen and transformed his career into a superstar status! Solo artist in his own right, he moved onto starting a new project and now we can see him with The Circle! Collectively now with 40 years of writing and performing hits – this is a special tour indeed! Led Zeppelin, Sammy Hagar's and Van Halen's back catalogue! Enjoy! !